The QTabDialog class provides a stack of tabbed widgets. 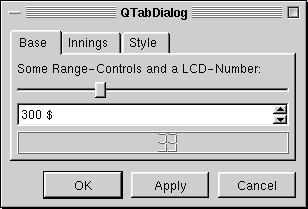 QTabDialog provides a tab bar consisting of single row of tabs at the top; each tab has an associated widget which is that tab's tab page. In addition, QTabDialog provides an OK button and the following optional buttons: Apply, Cancel, Defaults and Help. QTabDialog does not support tabs on the sides or bottom, nor can you set or retrieve the visible page. If you need more functionality than QTabDialog provides, consider creating a QDialog and using a QTabBar with QTabWidgets. Most of the functionality in QTabDialog is provided by a QTabWidget. See also QDialog and Dialog Classes. Constructs a QTabDialog with only an OK button. The parent, name, modal and widget flag, f, arguments are passed on to the QDialog constructor. This signal is emitted by show() when it is time to set the state of the dialog's contents. 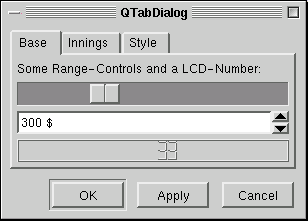 The dialog should reflect the current state of the application when it appears; if there is any possibility that the state of the application may change between the time you call QTabDialog::QTabDialog() and QTabDialog::show(), you should set the dialog's state in a slot and connect this signal to it. This applies mainly to QTabDialog objects that are kept around hidden, rather than being created, shown, and deleted afterwards. See also applyButtonPressed(), show(), and cancelButtonPressed(). This is a lower-level method for adding tabs, similar to the other addTab() method. It is useful if you are using setTabBar() to set a QTabBar subclass with an overridden QTabBar::paint() function for a subclass of QTab. The child is the widget to be placed on the new tab page. The tab is the tab to display on the tab page -- normally this shows a label or an icon that identifies the tab page. This signal is emitted whenever the current page changes. See also setApplyButton(), applyButtonPressed(), hasCancelButton(), and hasDefaultButton(). See also setCancelButton(), cancelButtonPressed(), hasApplyButton(), and hasDefaultButton(). See also setDefaultButton(), defaultButtonPressed(), hasApplyButton(), and hasCancelButton(). See also setHelpButton(), helpButtonPressed(), hasApplyButton(), and hasCancelButton(). See also setOkButton(), hasApplyButton(), hasCancelButton(), and hasDefaultButton(). This is a lower-level method for inserting tabs, similar to the other insertTab() method. It is useful if you are using setTabBar() to set a QTabBar subclass with an overridden QTabBar::paint() function for a subclass of QTab. The child is the widget to be placed on the new tab page. The tab is the tab to display on the tab page -- normally this shows a label or an icon that identifies the tab page. The index is the position where this tab page should be inserted. Returns TRUE if the page with object name name is enabled and FALSE if it is disabled. If name is 0 or not the name of any of the pages, isTabEnabled() returns FALSE. See also showPage(), QTabWidget::removePage(), and QWidgetStack::removeWidget(). This signal is emitted whenever a tab is selected (raised), including during the first show(). If text is a null string, no button is shown. See also setCancelButton(), setDefaultButton(), and applyButtonPressed(). See also setApplyButton(), setDefaultButton(), and cancelButtonPressed(). See also setApplyButton(), setCancelButton(), and defaultButtonPressed(). See also setApplyButton(), setCancelButton(), and helpButtonPressed(). Finds the page with object name name, enables/disables it according to the value of enable and redraws the page's tab appropriately. QTabDialog uses QWidget::setEnabled() internally, rather than keeping a separate flag. Note that even a disabled tab/page may be visible. If the page is already visible QTabDialog will not hide it; if all the pages are disabled QTabDialog will show one of them. The object name is used (rather than the tab label) because the tab text may not be invariant in multi-language applications.